Depending on season and or unit. CHEAPEST GUARANTEED RATES AT TIME OF BOOKING. If you are looking for Whitianga motel accommodation, Mana-Nui Motel is the place to stay while on holiday in the beachside resort town of Whitianga, Mercury Bay, on the Coromandel Peninsula, New Zealand. Your hosts Mervyn and Joanne Trebes warmly welcome you and extend their genuine Kiwi hospitality during your stay at their owner-operated 3 to 4 star 12 unit motel, situated in a prime position on the main street, Albert St, Whitianga. Central Town Location. 12 ground-floor units offering a clean, comfortable, affordable stay, all with free on site parking. 5 older classic block walled family units. 7 studio units, including 6 spacious studio units built 2002. Family environment, closest motel to shopping centre. Short, flat walk to restaurants, cafes, shops, beachfront, wharf, marina, museum, bowling green and Whitianga Hotel. 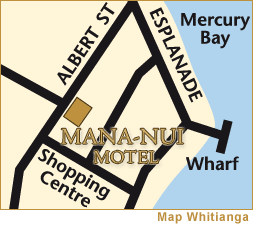 No excuse to drink and drive, stay safe while lodging at the Mana-Nui Motel. Some of the best beachs in New Zealand like Buffalo beach, Kuoatunu, Rings beach, Hot water beach, Hahei, Cathedral Cove, Flaxmill bay, Front beach, New Chums beach, Cooks beach, Purangi estuary all fronting the Pacific ocean are all within an easy drive of the Mana-Nui Motel. The Whitianga information centre, i-site, is only 2 blocks away featuring Coromandel accommodation, motels, apartments, ocean resorts, tourist activities available and supplying many more points of interest to make your stay more enjoyable when travelling / searching / exploring the oceanside area around Mercury Bay on the Coromandel Peninsula, NZ. Some examples include, The Lost Spring Thermal Pools, Glass bottom boat, Ocean Leopard tours, Kayaking, fishing, boating, tramping, horse riding, Driving Creek Railway and many more. We attempt to answer all enquiries as soon as practicable. If your enquiry is urgent please phone. Thank you for taking the time in searching this site and we hope Joanne and Mervyn can be of help and service to you in the future when staying at the Mana-Nui Motel Whitianga.